Delius Restaurant – Mobile App Development | ASTRALCOM - Content Strategy, Conversion Marketing and Customer Acquisition. Delius Restaurant – Mobile App Development | ASTRALCOM – Content Strategy, Conversion Marketing and Customer Acquisition. 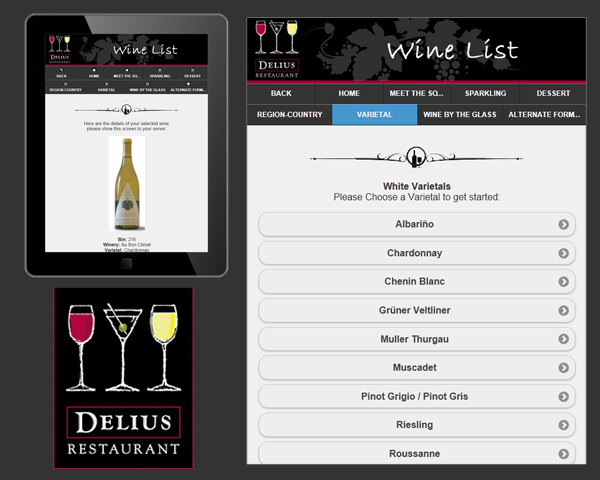 The Delius e-Wine List is a comprehensive, digital wine list provided to diners on a sleek Asus Transformer tablet. The wine list includes foreign and domestic wines, presented in an easy-to-use format which provides the diner with a wide array of wine choices to compliment every meal at Delius. “Working with ASTRALCOM to create the e-Wine List was important to me, because at every step of the project they made me feel that my vision was the top priority. Their creative contributions met and, in most cases, exceeded my expectations. I wanted to create a wine list that engaged and educated diners and ASTRALCOM clearly delivered,” stated the Sommelier and Co-Owner of Delius Restaurant. Contact us for customer experience solutions that you’ll raise a glass to.